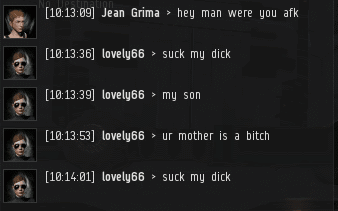 That kind of poor sportsmanship can only mean one thing: Time for another edition of the Highsec Miner Grab Bag! Ah, multitasking. When an Agent does it, it means they're doing more than one good thing at a time. However, when a carebear multitasks, it often takes them down the road to botting. After all, bots are all about enabling PvE'ers to multitask. 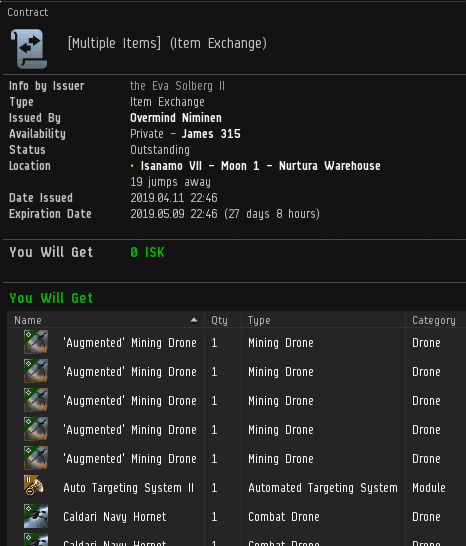 Spending real money for PLEX so you can spend time grinding isk--while AFK? 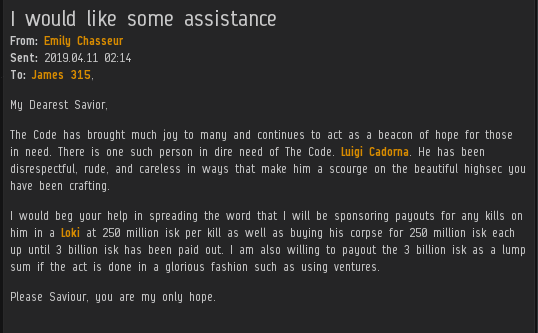 It sounds like he's paying CCP extra money so he can not play EVE. The big news this week was Brisc Rubal being kicked off the CSM and getting all of his accounts permabanned. 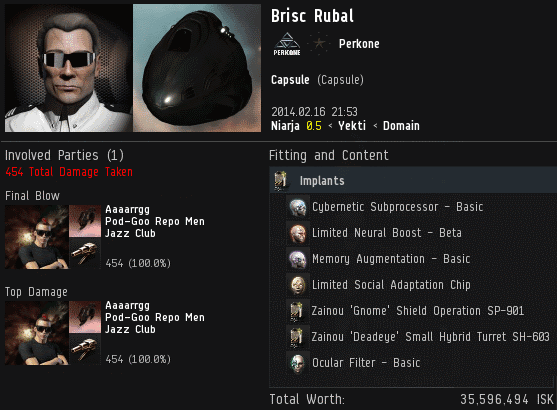 As you might recall, Brisc encouraged CCP to nerf wardecs or remove them from the game. In light of the recent news, Agent Aiko Danuja looked up Brisc on zKillboard and discovered that Agent Aaaarrgg was the first player to pod Brisc, all the way back in 2014. Makes sense. Emily Chasseur has put out a bounty on the famous Italian general Luigi Cadorna. Since the in-game bounty system is fatally flawed, I suppose asking me to post this EVEmail counts as "emergent gameplay"? What do you do when a miner refuses to buy a permit? A safe bet: Tell them to calm down. But what if they still won't calm down? ...Remind them that permits are mandatory. Sometimes I wonder if miners would engage in less illegal mining if they knew that it was an act of personal rudeness to me. ...Depends on the miner, I suppose. You can always tell the quality of a man by how they react when my name is dropped into the conversation. Translation: "Yes, I was AFK." talking about some kind of code ... what should it be followed? Could you explain to me? that I was carrying such a banned by this code, that he bothered to merge me in high sek? I just do not pomimayu ?! Why does this person have the right to judge other players by this "Code"? Thank. On-again, off-again Agent Overmind Niminen hoped to flee from the temptation to mine by contracting me his favorite Orca. Will it help? I don't know, but I do think that as a general rule, it's reasonable for people to send me their possessions. No one ever quit EVE regretting that they gave me too much stuff. Indeed. Not only a crook in real life but also in EvE. 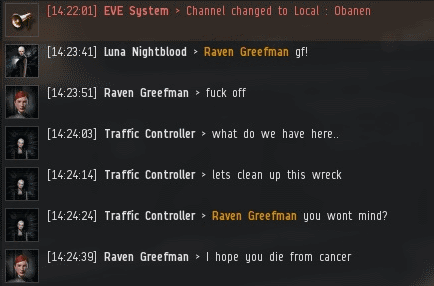 Heh, Raven Greefman in the 625m ISK Epithal discovers that he can't instawarp with any amount of istabs. Brisc Rubal and the INIT members are (were?) Content Haters and Elitists. Good riddance. And Overmind Niminen is back in James 315's good graces! Welcome back, hope your resolve lasts. 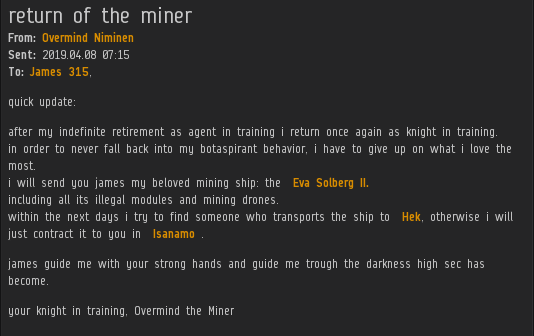 Might want to stop referring to yourself as a miner too. Overmind is back! There are people cheering for you! Among the many wonders The Code is capable of, the greatest is turning a miner into an Agent! And I bet you could turn your unique insight of the Dark Side into an edge!